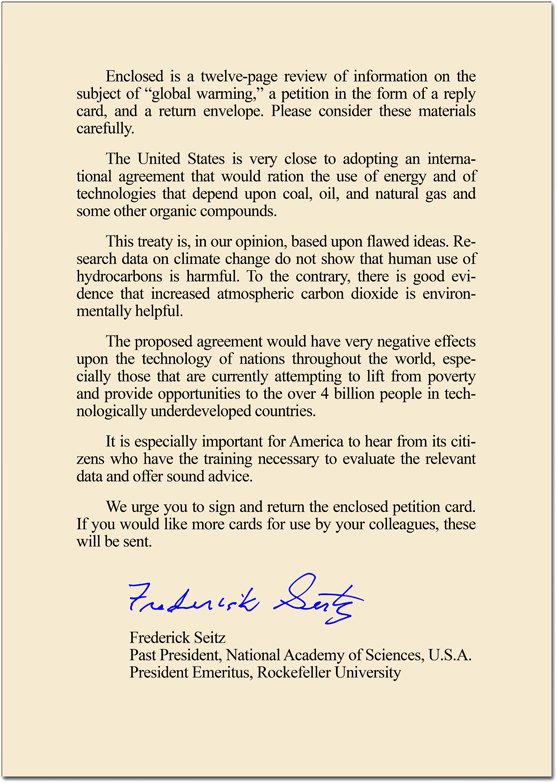 This letter from Professor Frederick Seitz is circulated with the petition. Physicist Frederick Seitz was President of the US National Academy of Sciences and of Rockefeller University. He received the National Medal of Science, the Compton Award, the Franklin Medal, and numerous other awards, including honorary doctorates from 32 Universities around the world. In August 2007, Dr. Seitz reviewed and approved the article by Robinson, Robinson, and Soon that is circulated with the petition and gave his enthusiastic approval to the continuation of the Petition Project. A vigorous supporter of the Petition Project since its inception in 1998, Professor Seitz died on March 2nd, 2008. For more biographical information about Dr. Seitz, please click here.